A book that has probably done more than any other to introduce people (including myself) to the world of the medieval library is Umberto Eco’s masterpiece The Name of the Rose. Published in 1980, it was translated into English in 1983, and made into a film starring Sean Connery and Christian Slater in 1986. A book about books, The Name of the Rose, is a story set in an early fourteenth-century monastery where secrets are currency, and knowledge is a weapon as well as a tool. 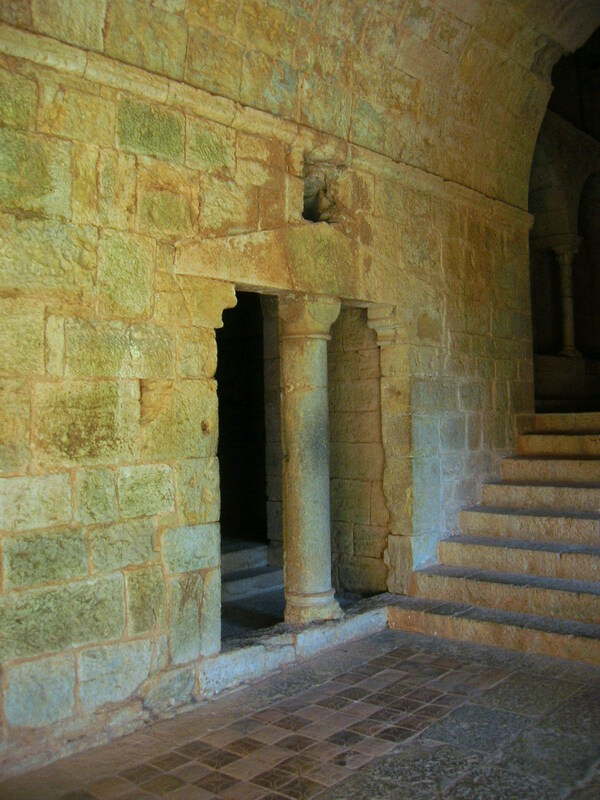 Essentially a murder mystery, the narrative moves between the primary buildings of the medieval monastery: the Chapter house, the library [aedificium], the cloister and the Church, as well as its more practical outbuildings: the pigsties and the smithy. 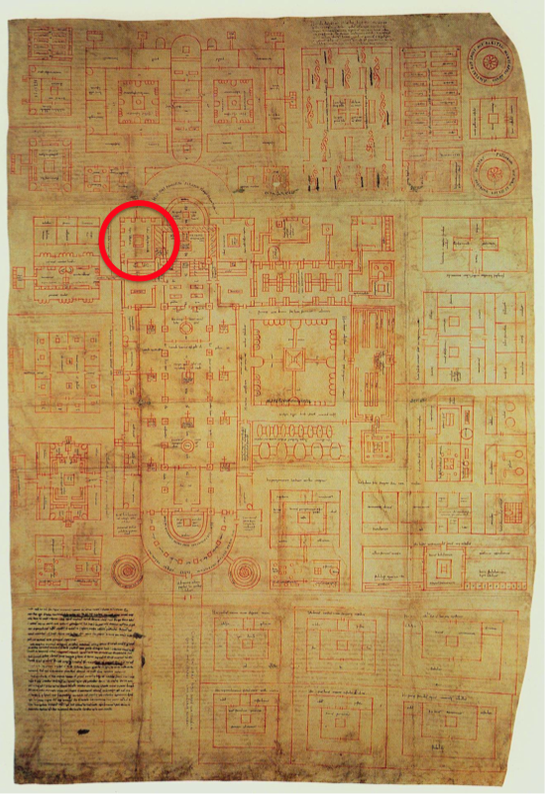 U. Eco, Map of the Monastery, The Name of the Rose. 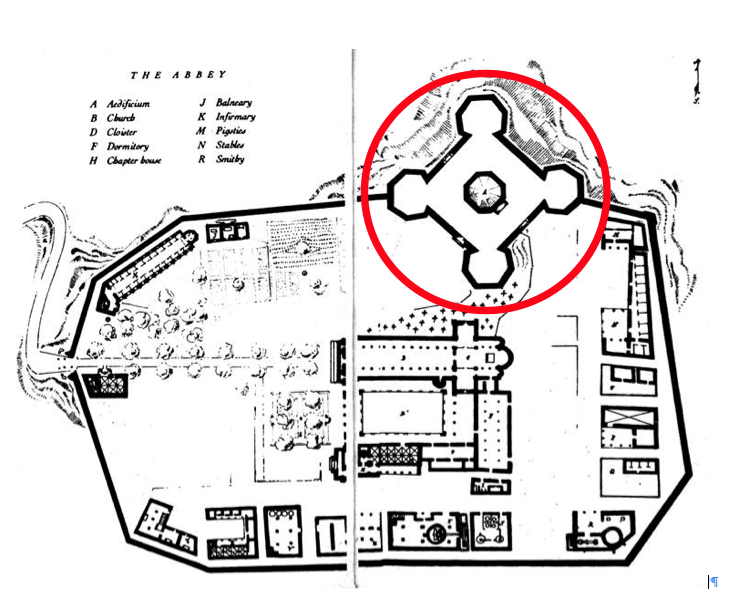 Library/aedificium indicated in red. 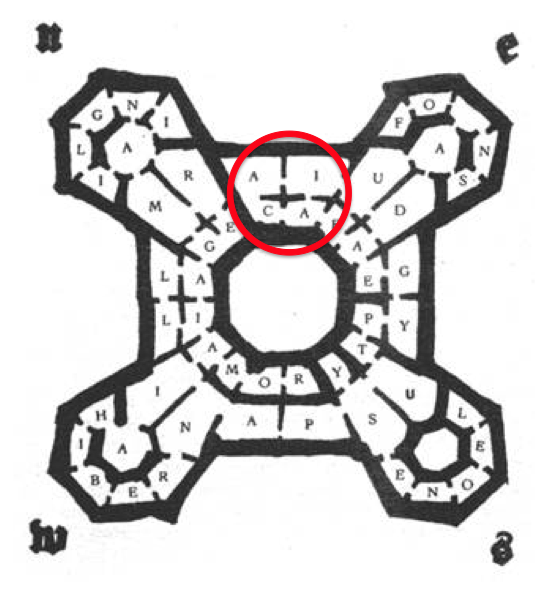 Even one of the more numerous collections, that of the abbey of Saint Gall which numbered 400 volumes in the ninth century was housed quite simply, on an upper floor over the scriptorium, as this plan from that period illustrates. Exploring the building, the hero William and his young companion Adso eventually come across a ‘great hoard of poets and philosophers of pagan antiquity’. The books in this section are arranged in rooms labelled ACAIA (over four rooms arranged in a square) – a name symbolising Greece (Achaea is a region in southern Greece referred to in Homer’s Iliad and Odyssey). Looking at the map, we can see that the classical authors were relatively isolated from the other holdings of the library – they could only be reached from one direction. Eco’s placement of these books in his fictional library echoes precedents of medieval booklists where secular texts were often separated from religious ones. For example, the early thirteenth-century inventory of the holdings of the monastery of Rolduc (Maastricht, Rijksarchief XIV D 4) distinguishes between theological (‘Hi sunt libri theoloici Rodensis ecclesie’) and other books (‘Hii sunt libri artium liberalium et philosophorum et auctorum et poetarum’). In fact, the ordering principles that govern the arrangement of Eco’s fictional library are comparable to some innovations that were taking place in medieval library catalogues in the fourteenth century, where recording of entries by location, content, and numbering of books were becoming more common, which demonstrate, as Sharpe points out, an interest not only in the content of the library, but also in its arrangement (R. Sharpe, ‘Library Catalogues and Indexes’, in The Cambridge History of the Book in Britain, ed. N. Morgan, R. Thomson [Cambridge, 2008], 195-218, pp. 203, 207). On a more profound level, Eco’s depiction of the library as a labyrinth symbolises an important aspect of the medieval quest for knowledge. Just as the medieval pilgrim walked the length of labyrinths in cathedrals such as Rheims and Chartres engaged in meditative prayer, so too the medieval reader would have contemplated and meditated on the texts they had access to. This entry was posted in Irene O'Daly and tagged Medieval Library. Bookmark the permalink.